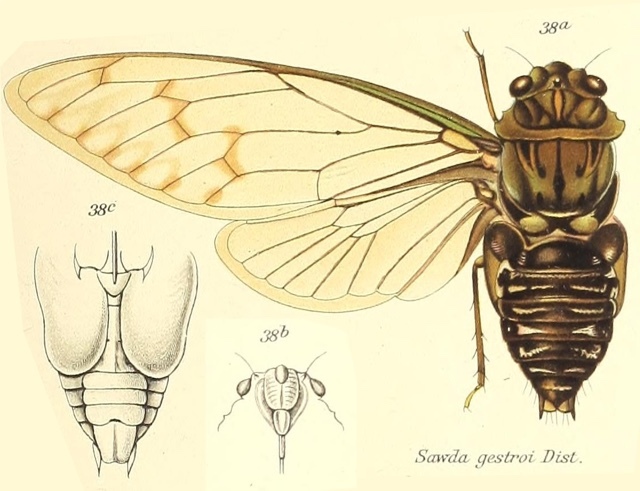 Cosmopsaltria gestroei (Distant, 1905) is a cicada found in Paupa New Guinea. Names… Sawda gestroi (in the image below) is an incorrect spelling of Sawda gestroei. The Sawda Distant, 1905 genus was merged into Cosmopsaltria Stål, 1866, which leaves us with the name Cosmopsaltria gestroei. Characters. — Body moderately long and robust, head as long as breadth between eyes, and including eyes as wide as base of mesonotum, with the front not twice as broad at base as anterior margins of the lobes of vertex, lateral margins obliquely continuous to front or very slightly sinuate; pronotum about as long as head, its lateral margins scarcely ampliated, but distinctly toothed or angulated; mesonotum slightly longer than pronotum ; abdomen short, about as long as space between apex of head and base of cruciform elevation; tympana covered; opercula in male broad, either just or longly passing middle of abdomen, well separated and not overlapping, more or less concavely sinuate on each side at basal areas, their apices rounded or obliquely truncate; rostrum reaching, sometimes passing, the posterior coxae; tegmina and wings hyaline; greatest breadth of tegmina about a third of length, venation normal, basal cell much longer than broad.